:A 3.2 oz Jar of Tarufata Sauce has Champignon Mushrooms, Extra Virgin Olive Oil, Black Summer Truffles, Salt, Parsley, Garlic and Aromas. 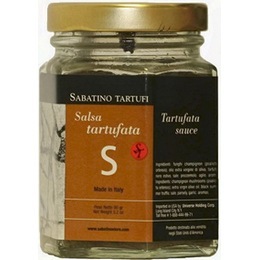 Made by Sabatino Tarufi, It is the perfect product for your "Italian bruschetta" (toasted bread), appetizers and pasta. Use it to make your favorite sauces.